The Wahoo Fitness ELEMNT App is the essential supplement for your new ELEMNT BOLT GPS Bike Computer. The ELEMNT BOLT is the newest installation in the range of bike computers offered by Wahoo Fitness, giving you plenty of functionality plus enabling you to measure your performance with ease. The feature filled ELEMNT BOLT is the new, even more streamlined wireless bike computer in the series, enabling you to do all the things you expect from a bike computer plus more. The ELEMNT BOLT Bike Computer is designed to be used in conjunction with the ELEMNT app, a free app which allows you to maximize the potential of the ELEMNT BOLT and makes getting the most out of your workout an easier task. As a stand alone device, the ELEMNT BOLT gathers information on temperature, elevation, location & speed. By adding in additional sensors, the ELEMNT BOLT can gather a wealth of information to expand your reporting ability on your workout. Use with or without your smartphone when performing a workout and enjoy quick and easy automated upload of your rides when connected to wifi. This product is designed for use on the iPhone 4s and newer, iPad 3rd gen and newer, iPad mini, iPad Air, and iPod 5th gen and newer. This setup guide is intended to assist with readying your ELEMNT BOLT for first use and pairing to the ELEMNT app. Turn on by pressing the power button located on the left side of the device. After first time loading, a QR code will be displayed. You are now ready to start setting up the ELEMNT BOLT with the ELEMNT app on your smartphone. Download the ELEMNT app from the App Store. Open the ELEMNT app & watch the introductory welcome video or skip to continue. Make sure you have bluetooth enabled on your mobile device. Select Start to proceed with pairing the app to your ELEMNT BOLT. NOTE: The ELEMNT app requires access to the camera in order to scan the QR code. Please enable access to the camera when prompted. The ELEMNT app will now display the login page. Log in by signing up to the Wahoo Fitness Cloud or use your Facebook login to proceed. NOTE: Login is necessary to backup your data and sync between devices. This step can be skipped, but will be required in order to view your data on other devices. Log in to your favorite fitness sites and ELEMNT BOLTwill automatically upload your rides over wifi. Alternatively, select Next and add these later. Complete a basic profile to be used with the ELEMNT BOLT. This information will be used to calculate metrics such as calories and HR zones. Alternatively, select Next and add these later. Enable Live Track if desired to allow you to see other riders on the ELEMNT BOLT and allows other ELEMNT users to see you. Additionally, you can also share a link with family and friends to view your location online. If you choose to enable Live Track, you can also automatically share your location with others. Add recipients via email to continue or select Next. Download the ELEMNT app from the Google Play store. Open the ELEMNT BOLT app & watch the introductory welcome video or skip to continue. Make sure you have bluetooth turned on. Select "Start” to proceed with pairing the app to your ELEMNT BOLT. NOTE: The ELEMNT app requires access to the camera in order to scan the QR code. Please enable access to the camera if prompted. The ELEMNT app will now display the login page. Log in by signing up to the Wahoo Fitness Cloud to proceed. After initial installation, the ELEMNT BOLT will perform a step-by-step tour. Read up on how to use or select "Skip tour” to exit. Your ELEMNT BOLT is now set up and ready for action. Choose the mount that best suits your riding style so that you can easily see the screen and access the buttons safely. Take care when tightening to ensure that the ELEMNT BOLT will be secure during your ride. For best results, tighten periodically to maintain a secure hold. The Out-Front Mount consists of a single mount, secured with an allen key bolt(2.5mm). NOTE: Allen key not supplied. Begin by removing/loosening the allen key bolt so the Out-Front Mount can slide over one side of your handlebars. When seated in your preferred location, replace/tighten the allen key bolt until the Out-Front Mount is securely fastened. The Wahoo logo should be facing upwards (and facing toward you if you were seated on the bike). Your mount is ready to use. The Aero Out-Front Mount was designed to be used specifically with the ELEMNT BOLT to generate the most aerodynamic advantage. The Aero Out-Front Mount consists of a single mount, secured with an allen key bolt (3mm). Begin by removing/loosening the allen key bolt so the Aero Out-Front Mount can slide over one side of your handlebars. When seated in your preferred location, replace/tighten the allen key bolt until the Aero Out-Front Mount is securely fastened. The Wahoo logo should be facing upwards (and facing toward you if you were seated on the bike). Your mount is ready to use. Ensure that the Rubber Mount insert is sitting flush with the Plastic Stem Mount. The bike mount is now ready to be installed. Place the bike mount in alignment on the stem of your bicycle, ensuring that the rubber insert side is facing down and the Wahoo logo is on top and facing towards you (if you were seated on the bike). NOTE: This mount can also be installed on your handlebars if required. Thread two of the zip-ties through the holes provided in the bike mount and tighten securely around the bicycle stem. When tightened to your satisfaction, trim any excess zip-tie cables. Your mount is ready to use. Align the ELEMNT BOLT mount connector (on the back of the ELEMNT BOLT) with the bike mount. The ELEMNT BOLT should be perpendicular to the bike mount, with the Wahoo logo on the ELEMNT BOLT facing away from you. Insert the ELEMNT BOLT mount connector into the bike mount. Twist one quarter turn clockwise to secure. To remove, grip the ELEMNT BOLT securely and twist one quarter turn anticlockwise. Lift the ELEMNT BOLT out of the bike mount. Power Button (left side button): Use to power on/off or access the Settings menu. Easily add your sensors at any time by tapping the power button and selecting the Add a Sensor. History Button (bottom left button): Use to display recent workout history and weekly report. More detailed workout information is available through the app when you connect to wifi (upload of workouts is automatic). Additionally, the History button is also used to stop a workout or start a new lap during your ride. Start Button (bottom centre button): Use to start/pause/resume a workout, or toggle Settings menu items on/off. Page Button (bottom right button): Press the Page button to switch between workout data, climbing and navigation pages. Menu Toggle (right side up/down buttons): Use to navigate the Settings menu or quickly see more or less data by zooming in or out on any page when performing a workout. LED indicators: LED indicators provide a quick way to see if you’re on pace with important performance metrics. LED indicators can be set to indicate speed, power or HR. Speed: The middle LED is your current average performance, LEDs to the right mean higher than average and LEDs to the left mean below average. Power: The LEDs will indicate your current power zone from left to right. Between 6 and 8 zones may be configured. HR: The LEDs will indicate your current Heart Rate zone, from left to right. Additionally, the LEDs are also used for notifications, page indication, turn by turn directions and Strava Live Segments. Sensors: View added sensors or add a new sensor. The ELEMNT BOLT will automatically try to connect when you hold your compatible sensor nearby. Forget Phone: Use this function to forget the current pairing and display a QR code to enable phone pairing again. Version: Displays current version and enables manual update over wifi. Factory Reset: Restores settings to factory default. Warning: Will delete all workouts stored on the device. Run Setup: Enables selection of language, units, timezone, time & date. Compliance Info: Displays ELEMNT BOLT compliance information. The ELEMNT BOLT is charged by using the Micro USB cable provided. When fully charged, the ELEMNT BOLT will function for up to 15 hours. NOTE: Running the backlight and LEDs continuously will diminish the battery at an accelerated rate. For maximal battery life, use the backlight only when necessary and turn off LED notifications. Gently remove the silicon dust cap covering the charging port on your ELEMNT BOLT. Insert the plug of the Micro USB cable into the charging port. Connect the Micro USB cable to a suitable power source to charge. e.g. a computer USB port, or if using in conjunction with an AC adapter, to a wall outlet. When charged, remove the Micro USB cable from the charging port. Replace the silicon dust cap, ensuring that it is seated firmly to prevent moisture or dust from entering the device. NOTE: For best results and battery life, always charge to full capacity when possible. Additionally, take care when handling the silicon dust cap. Always clean and dry the area surrounding the charging port thoroughly if it becomes wet or dirty, and do not plug into a power source until the area is free of moisture or debris. Corrosion and damage to the ELEMNT BOLT may occur if not handled correctly. The workout information displayed on the ELEMNT BOLT at the end of your ride only represents a small portion of the data that is available for review. To access more information, upload your workouts to the app or your preferred compatible application or website. Uplo ad preferences are managed via the app. (Automatic upload of workouts can be selected via the Settings menu, and manual uploads can be managed via the Results menu.) Transfer of workouts occurs automatically or manually whenever a wifi signal is present, sending data to whichever apps or sites have been preauthorized to receive them. However, the Micro USB can also be used to manually transfer workout data from the ELEMNT BOLT to another device. For PC users: Plug in your ELEMNT BOLT to your PC via the Micro USB and the internal memory will function just like a flash drive. For Mac Users: An additional application is required to function as an interface - please see How do I Connect the ELEMNT to my Computer? App & firmware updates will be installed automatically when a wifi signal is present. Alternatively, manual installation of app and firmware updates can be accessed via the Settings menu if required. Open the Settings menu on the ELEMNT BOLT. Scroll down to the Version tab and select Check to perform a manual check for updates. Select Yes to check and download an update, if available. The Version information will read Up to Date if no updates are available at this time. NOTE: Automatic updates will only be performed after initial installation or just prior to powering off, to prevent interfering with your use of the ELEMNT BOLT. The ELEMNT BOLT can work in conjunction with your smartphone and display notifications during your workout, as per your preference. If activated, phone calls, SMS and email alerts (iOS only) will be temporarily displayed during your ride, and be accessible from the Settings menu. Dismiss each alert from the Settings menu to view additional alerts. Turn this function on or off by accessing the Settings menu on your app. NOTE: This feature requires you to have your phone with you during your ride. The ELEMNT BOLT measures temperature during your workout, but occasionally may display temperatures that differ from the true temperature of your surroundings. For example, this may occur when the device is placed in direct sunlight, is being charged via an external battery or is subject to sudden changes in temperature. In the event that multiple same-information sensors are being employed (e.g. two speed sensors), the ELEMNT BOLT uses a quality of data hierarchy to determine which sensors will be used to gather data during your workout. In this scenario, if one sensor should fail, the ELEMNT BOLT will automatically switch to the next data source and continue data gathering. Manual selection of a duplicated data source is not available. Add sensors to gather more information during your workout and get a more comprehensive report about your ride. Sensors can gather a multitude of information such as speed, heart rate, cadence, power and much more. Adding a new sensor to your ELEMNT BOLT is as simple as waking up your sensor & opening the Settings menu to access the Add a Sensor function. Place the sensor close to the ELEMNT BOLT and you’ll be prompted to save after a few seconds. If you have many close sensors then you will see a More option (bottom right button). If you start your workout without waking up your additional paired sensors, you can still wake them and they will begin to send data. Additionally, you can pair a new sensor at any time, even during a workout. The ELEMNT app consists of three main areas: Results, Profile & Settings. Together with your ELEMNT BOLT, the app enables you to record and personalize your workout, view in depth data regarding your ride and share information with other apps and people. Once set up, the ELEMNT BOLT does not require your smartphone to be nearby to record a workout. However, please note that if using certain functions or sensors (e.g. alerts, Live Track), they may require the smartphone to be nearby in order to operate. Plan your ride accordingly. The Ride menu enables you to manage your ride via the ELEMNT app and easily view sensors, routes and more. Use the Ride menu to configure your ride, select a route, or check your sensor status. Use the Ride menu to see an up to date summary of your ride, select/change routes, navigate to points of interest and view a map of your ride. In the Ride menu, you can access and view the connection status of your paired sensors from the top of the page. Select one of the sensor icons at the top of the page to view the Saved Sensors or to add a new sensor. The ELEMNT app will allow you to add new sensors and manage existing ones by using the auto detect function - just make sure your sensor is awake and nearby. Routes are intended to make navigating during your workout a breeze. There are a variety of ways that routes can be created, from simple navigation to a destination, through to using previous workout history or even importing routes from a preferred site. In Outdoor mode: GPS and elevation detection is enabled for live tracking and workout data recording. In Indoor mode: GPS and elevation is disabled, as these functions are not required for indoor training. Search for Location: Got somewhere you want to go, but no planned route? Use this feature to enable the Take Me Anywhere function, which will plan your route accordingly from A to B and send it to the ELEMNT BOLT. Use the search tab to look for a location or tap a spot on the map to create a route. Tap Select to sync the selected route with the ELEMNT BOLT. NOTE:The ELEMNT BOLT must be turned on and connected via wifi in order to receive routes from the app. Tap the route and either select Clear Route or Change Route to select a new destination. Select a ride from your displayed history to make into a new route. A prompt will appear to enter a name for the route you are creating. Enter a name and select ‘Done’. Your new route will now be uploaded to your ELEMNT BOLT. NOTE:You must login & authorize access to the above sites in order to use this feature. Select a GPX/TCX file from a website, email attachment, dropbox folder, etc. Tap on the GPX/TCX file, select ‘open in’. 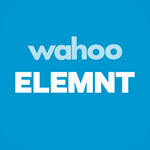 NOTE:Your ELEMNT BOLT must have wifi connection and you must be logged into your Wahoo Fitness account. Once you have created a route and synced the details with ELEMNT BOLT, press Start on the ELEMNT BOLT to begin a workout and view navigation. Navigation will be displayed on the Routes page on the ELEMNT BOLT, and within the Ride page on the app while the ride is in progress. A basic summary will be displayed in the app in addition to the ride navigation. Additionally, you can modify your route at any time by selecting the route name at the top of the page to either clear the route, or change to an alternative route. When your workout is complete and the ELEMNT BOLT syncs with the app, the Results page will be displayed on the app to show a detailed summary of your workout. If you have imported or created a route for use on the ELEMNT BOLT, it will be displayed here with a basic summary of the information regarding the ride. Export a link at any time containing your Live Tracking information with friends or family to let them see where you’re at on your ride. Displays your workout data and ride statistics. Select any workout to view more information. If you have automatic uploads configured on the app, your workouts will be exported automatically when connected to wifi. Alternatively, you can manually upload your data to a third party app of your choice by selecting the Sharing icon located in the top right corner of the screen. NOTE: You will need to login and authorize sharing of information with the desired app in order to export information. iOS: Selecting Edit or swiping left. Using the Edit function enables you to multiple-select items to be deleted. Select Delete to confirm. Android: Long press (Android) on the selected ride. Select Delete to confirm. NOTE: Using the Edit function enables you to multiple-select items to be deleted. Edit your personal information or make modifications to your preferred settings here. Log in to the Wahoo Cloud: to enable automatic updates, backup and syncing of workout data. Access your Linked Accounts: to share workout data with the authorised apps of your choice. Edit your Profile: Create a profile by recording your personal information. Entering your details enables fitness calculations such as calorie burn. FTP: Use the default or enter your Functional Threshold Power, if known. Heart Rate Zones: Use the default or enter your Heart Rate Zones, if known. Using the ELEMNT app, you can reconfigure the existing workout pages or configure up to 5 personalized workout pages to be displayed on your ELEMNT BOLT. Ensure the ELEMNT BOLT is powered on and nearby. Open the Settings menu in the app. In the Sensors & Data menu, open the Customize Pages tab. Toggle each desired workout page on or off for display on the ELEMNT BOLT. Select a workout page to edit. iOS: Tap to change a data field or drag to reorder. Tap on an existing field to change your selection. Select Done when finished, and use the Back button to exit. Name the new page when prompted and select Done to proceed. Tap to nominate the 10 data fields to be displayed and select Save. Tap to open the page you created and drag to reorder your preferences. When finished, select the Back button to exit. Select Add Data Field to choose a data type. Select Edit or swipe left (iOS only) to nominate screens to be deleted. NOTE: The default workout pages cannot be deleted. Select Reset when prompted to return all pages to the default setting. Use sensors with the ELEMNT BOLT to collect & display more data during your workout. If you have additional sensors like a power meter or heart rate monitor, you can add a new sensor from the Settings menu on the app or on the ELEMNT BOLT itself. Open the Settings menu on the app. Select Set Up Sensors from the Sensors & Data menu. The ELEMNT app will automatically begin to search for compatible sensors, just make sure your sensor is awake and nearby. Any available sensors will appear as a list. Tap on an unsaved sensor & select Save Sensor to add it. The saved sensor(s) will be displayed in the Sensors menu. Select the sensor to delete & select Forget Sensor to confirm. Toggle the LEDs and sound alerts on or off as per your preference. Manually add, remove and update map packs on your ELEMNT BOLT. You will need a wifi connection to download maps, make sure you are prepared before you travel. Toggle Live Track on to enable those with access privileges to see your location. You will need to login or create a Wahoo Fitness cloud account to enable Live Track. If enabled, share the link provided with anyone you wish to see your location during your ride. Additionally, you can set up an Auto Share function on your ELEMNT BOLT so that your friends and family will know your location each time you ride. Simply nominate who to notify and the ELEMNT BOLT will do the rest. Always Rotate Map: Enable to have the map rotate so that you are always heading towards the top of the display. Connect with Strava to use Live Segments, automatically upload your rides and more. Toggle personal preferences for display during your workout. Set as On for default, the Auto Pause function is used to prevent workout data from being recorded during periods of inactivity. Workout recording will resume automatically with detectable activity. Turn this function Off if all information, including inactivity, is to be recorded. Set as Off for default, the Auto Lap function can be set to a given distance or time depending on your preferences. Set as Off for default, the backlight can be adjusted to be turned on for 5 seconds at a time, or always on to improve visibility. Alternatively, select your own time preference. The ELEMNT BOLT requires access to a wifi connection in order to perform automatic workout uploads, firmware updates and download routes. Access to wifi is essential for proper functioning of the ELEMNT BOLT. Use this function to select a network to join. Toggle On to enable automatic upload of all rides to authorized websites whenever ELEMNT BOLT is in wifi range. Alerts from your smartphone can be displayed as popups on the ELEMNT BOLT during a ride when linked. Toggle Phone Calls, Messages and Email (iOS only) alerts as preferred. Additionally, use the Do Not Disturb function to nominate a period of time when alerts will be disabled. You must have your smartphone nearby and the ELEMNT BOLT app open in order to receive alerts. Enable auto shutdown as per your preference. Displays the current version information for the ELEMNT BOLT. Additionally, if you need to un-pair the ELEMNT BOLT, you can do so here. While the ELEMNT BOLT is still connected, select Unpair ELEMNT BOLT from the Settings menu. This will bring up a prompt recognising that the ELEMNT BOLT is no longer paired to the app, but still connected to the iPhone. The prompt will ask whether you would like to pair again (does not require a QR code). Accept, and the ELEMNT BOLT will pair to the app. Alternatively, you may completely remove the ELEMNT BOLT and begin again, see Advanced Unpairing/Pairing. Open the ELEMNT BOLT Settings menu and select Pair Phone. A QR code will be displayed. Open the app and select Unpair ELEMNT BOLT (either from the Settings menu, or displayed on screen if the app is already open). The app will recommend you also remove the pairing from the iPhone Bluetooth menu* and then prompt you to scan the QR code displayed on the ELEMNT BOLT. Hold the ELEMNT BOLT up to the phone camera to scan the QR code. A prompt will appear on the app requesting to pair the ELEMNT BOLT with your phone. Select Pair to complete the pairing process. If you do not select Pair (by allowing a timeout) or you select Cancel, pairing will not proceed and you will need to select Pair Phone again on the ELEMNT BOLT. If the ELEMNT BOLT is not currently connected to the app, a searching screen will be displayed on your smartphone. On this screen there will be an option to Unpair ELEMNT BOLT. Unpairing your ELEMNT BOLT will prompt the app to begin the pairing process again. Turn on your ELEMNT BOLT and continue as above from Step 2. *NOTE: Although recommended, removing the existing pairing from your phone (accessible via the iOS bluetooth settings) is not essential. You will notice that if you do not remove this pairing, multiple entries will appear in your My Devices listing. These additional (defunct) entries can be deleted at any time. To do this, open the phone Settings menu, access the Bluetooth menu and forget the unwanted ELEMNT BOLT pairing from My Devices. While the ELEMNT BOLT is still connected, select Unpair ELEMNT BOLT from the Settings menu. Hold the QR code displayed on the ELEMNT BOLT up to the camera on your smartphone. The ELEMNT BOLT will pair with your smartphone after a moment or two. If the ELEMNT BOLT is not currently connected to the app, a searching screen will be displayed on your smartphone. On this screen there will be an option to Unpair ELEMNT BOLT. Unpairing your ELEMNT BOLT will prompt the app to begin the pairing process again. Turn on your ELEMNT BOLT and select Pair on the app and then continue as above. Turn on your ELEMNT BOLT. Open the ELEMNT BOLT app on your smartphone for additional features (Live Tracking, notifications, etc.) Keep your smartphone nearby if performing a workout that requires phone proximity. After loading, press the Start button to begin your workout. If you have additional paired (and awake) sensors, they will automatically start recording data. The ELEMNT BOLT will record temperature, elevation, speed & location plus any additional information as per your paired sensors. Any cessation of activity will result in the Autopause function temporarily suspending data recording until activity resumes. Press the Lap button to start a new lap (can be automated on the Companion app determined by time or distance as per your preferences). Press the Pause button at any time to temporarily stop your workout. Press the Page button to scroll through the workout pages and maps (displayed as per default or your preference). On the Maps page, use the Route button to open an imported route to use during your workout. Use the buttons on the right side of the ELEMNT BOLT to zoom in/out on a given page. Use the Settings menu to access notifications. If using a KICKR, you can access the KICKR controls as a workout page. Select Pause and then Stop to end your workout. Select Yes when prompted to confirm. Your basic workout data will now be available from the History page. Alternatively, connect to wifi to either automatically or manually upload your data to the app for more detailed reporting on your workout. Sharing data is as simple as logging in and authorizing the app to enable access and you're away. Access the Profile menu in the ELEMNT app to manage your Linked Accounts. Forced Reboot: Hold down the power button for 10 seconds to perform a forced reboot. e.g. Generally used if the screen becomes non-responsive. Factory Reset: Accessible from the Settings menu, restores settings to factory default. Warning: Will delete all workouts stored on the device. For more help, check out our support FAQ here. Should the ELEMNT BOLT require cleaning, use a moist soft cloth or similar to remove any debris. Strong cleaning agents are not recommended, as this may damage the device or reduce its lifespan. The ELEMNT BOLT uses as internal rechargeable battery, which is charged via a micro USB cable. The rechargeable battery in the ELEMNT BOLT is not removable. Any attempt to remove or tamper with the battery may void the warranty for this device.